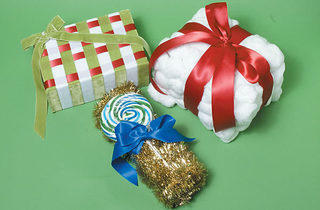 Ditch traditional wrapping paper and get creative with drug-store holiday (and everyday) supplies. Just like the garland wrapping, tape one end of a ribbon to the top of the box and then wrap it tightly around until the gift is completely covered. (You shouldn’t see any box peeking out.) Next, weave strips of a different color ribbon of the same width over and under the already wrapped ribbons to create a basket-weave look on the top of the box. Cut the ends of those ribbon strips long enough so they cover either end of the box; tuck the ends underneath the ribbons on the bottom of the box, adhering with double-sided tape. Start off by wrapping your box as usual with a paper shopping bag or white computer paper so that the actual box stays hidden before the lucky giftee unwraps it. Next, cover the top and sides in strips of double-sided tape. 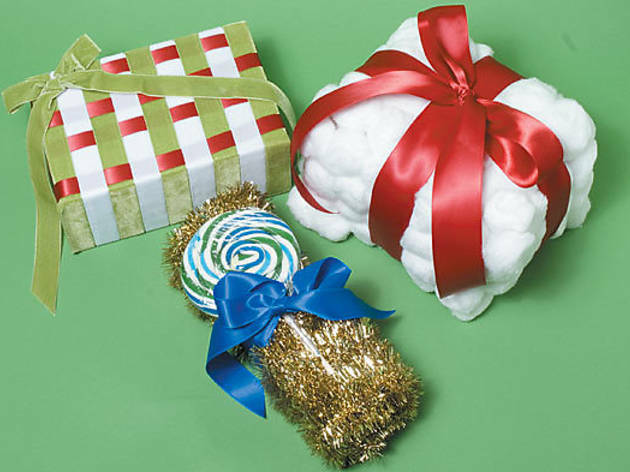 Using an entire bag of 100 jumbo cotton balls from the drugstore, cover the box in rows of cotton balls until it looks like a marshmallow cloud and you can’t see the underlying paper. Tie it up with a wide ribbon. Tape one end of a shiny garland to the top of your box and wrap it tightly around the box until you reach the other end so that four of six sides of the present are covered in garland. Then cover both bare ends of the gift with double-sided tape to adhere a coiled-up garland on both sides. Add a pop of color and charm with a lollipop in addition to a bow. Not feeling crafty? Head to Anjenu for a custom gift-wrap ($5, plus the cost of the paper).